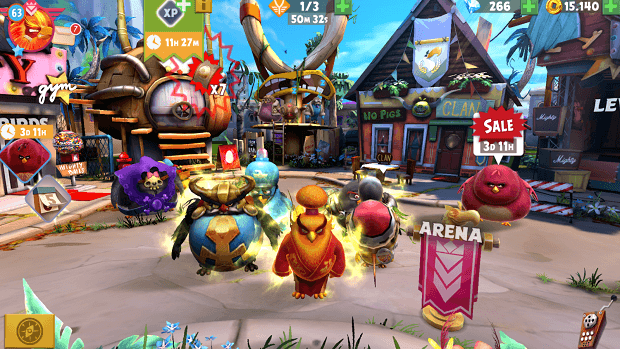 Angry Birds Evolution is a free-to-play game that requires the usage of several kinds of currencies, including Gold Coins. These are an important part of the game, and you'll want to get as many as you can if you want to evolve your favorite birds to take the fight to the pigs. You won't just amass a hundred or so coins overnight or anything like that, but this guide will help you fluff up your stores of gold coins to ensure you've got enough to bypass spending real money on them. It will take a little time, but if you follow these steps you'll be rolling in the dough in no time. You can collect birds in Angry Birds Evolution as you play, and they’re worth a set amount of coins. Each regular bird is worth 10 gold coins depending on how many stars it has. If you receive a 1-star bird, that means you can turn it around for 10 coins. If you have a 2-star bird, you can sell it for 20 coins. The goes on up to 50 coins per 5-star birds. Sell the lesser birds worth 20 and 30 coins and sell a couple of your higher-rarity birds, but hang on to some of them for other purposes in-game. These are some of the quickest and surefire ways to get additional coinage. After you hit level 6 you’ll be able to do Timed Adventures, which are specific quests meant for you to complete on your own time. If you use your Scout to finish a mission, you might be assigned one. Going out and completing them does take time, but it’s time you’re going to be spending in the game anyway, so you may as well go ahead and rake in the extra cash while you can. Golden Pigs start coming into your game around Level 11. You really see a whole lot of them cropping up at Level 18, however, so make sure you eliminate them first and you’ll find yourself bagging a whole lot more Gold Coins that way.